Brian Kesinger is an Annie award winning story artist for Walt Disney animation studios and creator of the popular steampunk duo, Otto and Victoria. 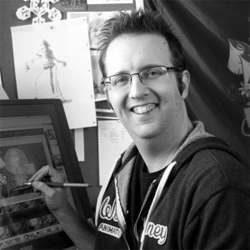 Brian's 18 year career at Disney has spanned both hand drawn and check animated films from Tarzan to Big Hero 6. After hours Brian has created amazing steampunk worlds populated with unique and memorable characters under the banner of his tea girls. Brian's personal work has been growing in popularity and is inspiring cosplay, fashion, and even body art. His award winning book, Walking Your Octopus, is a collection of work that showcases his style, wit, and ability to tell engaging stories in original ways.